The new R&S ZVA50 is the first four-port 50 GHz network analyzer in the world. Featuring two integrated sources, the analyzer makes it possible for the first time to perform measurements on multiport and balanced components in this frequency range using a single instrument. The R&S ZVA50 also offers unique features and specifications for pulsed measurements in radar and satellite applications. 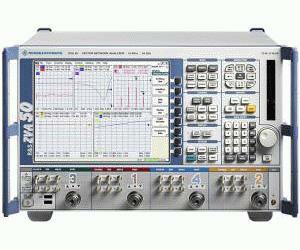 The four-port architecture of the R&S ZVA50 allows users to perform tests on balanced components. Such components are increasingly used for wired signal transmission at high data rates. The integrated coherent sources make it possible to measure linear and nonlinear DUTs using differential stimulus signals. The phase offset between the two signals can be selected by the user, thus allowing active components to be analyzed under real conditions. In addition, the second integrated source of the R&S ZVA50 saves money by eliminating the external generator usually required for intermodulation and mixer measurements. This significantly simplifies operation and test setup. Moreover, the integrated source sweeps the frequency range to be analyzed 10 times faster than external solutions and thus substantially increases measurement throughput. Since S-parameter and intermodulation measurements can be performed simultaneously, DUTs need to be connected only once - a clear edge in measurement speed. The R&S ZVA50 supports all conventional methods required for pulsed measurements in radar and satellite applications. A large measurement bandwidth of 15 MHz combined with high sampling rates allows pulse profile measurements with a time resolution of 12.5 ns. Optimum values for dynamic range (130 dB), output power (+13 dBm) and measurement speed (3.5 µs/point) also make the R&S ZVA50 a safe investment for future applications. The R&S ZVA50 features a number of wizards that provide the best possible support when performing complex measurement tasks. They guide users step-by-step through the settings for mixer measurements, pulsed and differential measurements, or calibrations to name just three examples. Up to 60,000 measurement points per trace are possible, and convenient marker and analysis functions are provided for evaluating them. A total of 100 traces can be displayed. Other highlights of the R&S ZVA50 include versatile mathematical functions, embedding/de-embedding using virtual networks for impedance matching, as well as comprehensive calibration methods. Price shown is for two-port model.